Francis Barry Byrne, ca. 1913, possibly in Los Angeles. From Alfonso Iannelli: Modern by Design by David Jameson, Top Five Books, 2013, p. 98. Afer stints partnering with former fellow former Frank Lloyd Wright apprentices Walter Burley Griffin for a year in Chicago and Andrew Willatzen for three years in Seattle, Francis Barry Byrne traveled to Southern California to visit Lloyd and John Wright. The brothers were then living rent-free in a San Diego cottage designed and owned by Lloyd's employer Irving Gill. Lloyd and John were draftsmen working for Irving Gill and Harrison Albright who at the time had very busy offices in San Diego and Los Angeles. Gill, Albright, Lloyd and John were all then commuting almost weekly between the two cities. 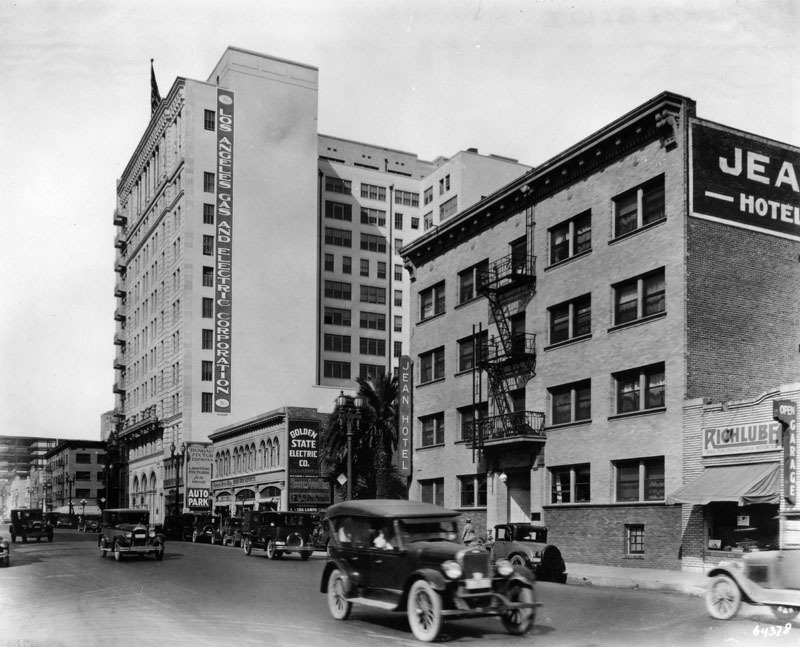 While in Los Angeles Gill was living at the Van Nuys Hotel while his office was located in the Citizen's National Bank Building coincidentally designed by John Wright's employer Harrison Albright. (Author's note: In June of 1913 Gill more or less permanently moved his home and office to a Victorian mansion converted into a rooming house at 913 S. Figueroa St. across the street from the Friday Morning Club. 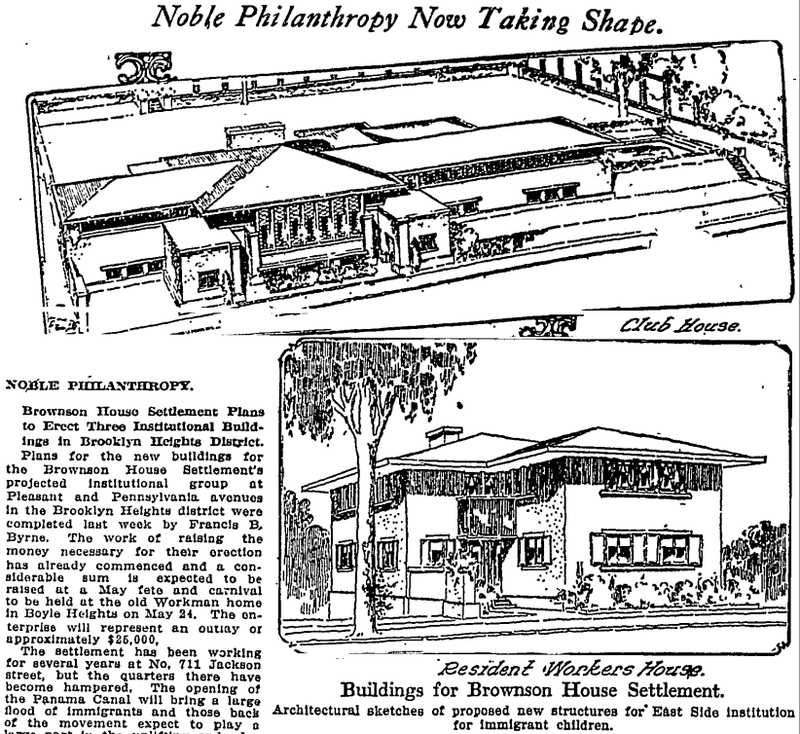 For much more on this see my "Irving Gill, Homer Laughlin and the Beginnings of ModernArchitecture in Los Angeles, Part II, 1911-1916" and my "Irving Gill's First Aiken System Project: The Sarah B. Clark Residence, 7231 Hillside Ave., Hollywood, Spring 1913 (Gill-Aiken). 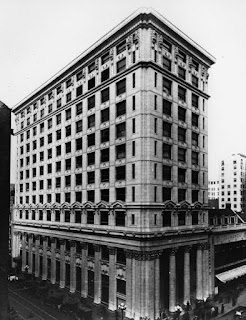 Byrne decided to try his luck in Los Angeles and set up shop in suite 807 of the Los Angeles Trust and Savings Building at 215 W. 6th St. next door to the architectural offices of Ross and Mott Montgomery (see below). 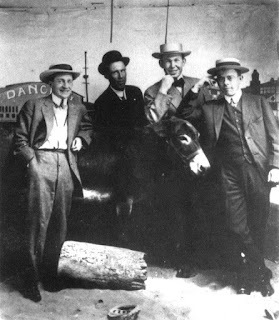 Byrne and the Wrights became fast friends with the Montgomery brothers evidenced by Lloyd either working for or sharing office space with them in early 1914 after leaving Gill's employ. The Montgomerys were designing numerous high end residences that needed high end landscapes to match. ("Personal,"Architect and Engineer of California, March 1914, p. 113. 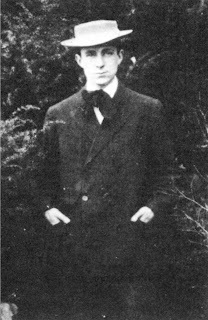 (Author's note: Ross Montgomery would also serve as best man for Lloyd when he married Aline Barnsdall's Los Angeles Little Theater leading lady Kirah Markham in November of 1916. (For much more on this see my "R. M. Schindler, Edward Weston, Margrethe Mather, Anna Zacsek, Lloyd Wright, Lawrence Tibbett, Reginald Pole, Beatrice Wood and Their Dramatic Circles"). 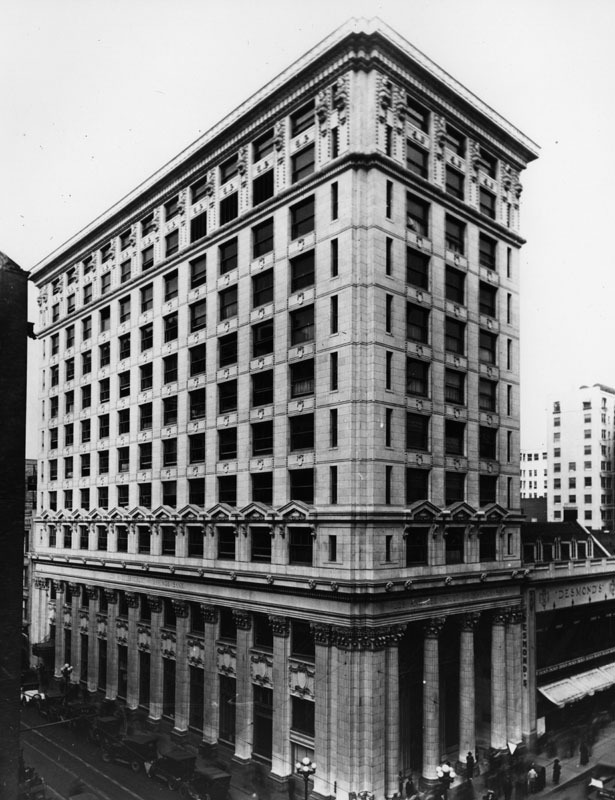 Los Angeles Trust and Savings Bank Building, 215 W. 6th St., Parkinson and Bergstrom, architects, 1910. From Los Angeles Pulic Library Photo Collection. Jean Hotel, 840 S. Flower St., architect unknown, built in 1911. From Los Angeles Public Library Photo Collection. Byrne moved into an apartment in the Jean Hotel, a block away from Gill's soon-to-be office/residence at 913 S. Figueroa St. sometime around March or April of 1913. By then Lloyd and John were also seemingly spending the lion's share of their time in Los Angeles as Gill was extremely busy as chief architect of the new Industrial City of Torrance, numerous residential projects in Los Angeles, a school and railroad station in Fontana while concurrently establishing his Concrete Building and Investment Company. While in Los Angeles the Wright brothers were rooming with Byrne who had stayed with them briefly in San Diego. (For much more on this see my "Gill-Aiken" and "Gill-Laughlin II"). Barry Byrne, left, Lloyd Wright, second from right. (Others possibly Mott and Ross Montgomery, see "Gill-Laughlin II"). Photographer unknown (John Lloyd Wright or Alfonso Iannelli? ), ca. 1913. From The Architecture of Barry Byrne, Taking the Prairie School to Europe, by Vincent L. Michael, University of Illinois Press, 2013, p. 20. Courtesy Barry Byrne Family. 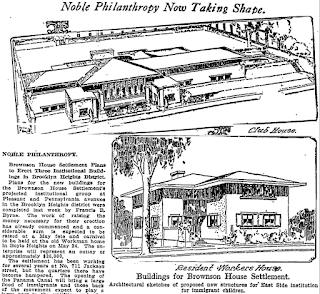 "Noble Philanthropy Now Taking Shape, Los Angeles Times, May 18, 1913, p. VI-4. Until I discovered the above article it had been thought that Byrne had not received any commissions during his one year stay in Los Angeles. He landed his only known Los Angeles commission around April of 1913. 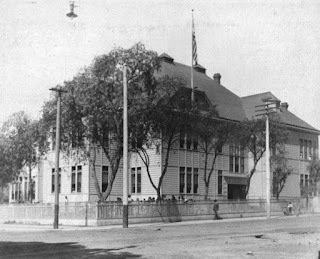 Presaging his numerous future projects for the Catholic Church, the project was for the design of a three building compound for the Church-affiliated Brownson House Settlement Association on Church property between Pleasant and Pennsylvania Avenues near Brooklyn Ave. in Boyle Heights. (Ibid). 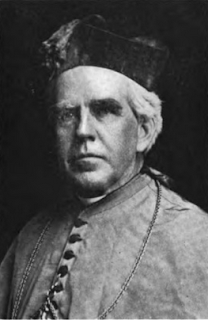 The site had been recently acquired for the settlement house compound by Bishop Conaty whom fellow Irishman Byrne would likely have met (see below). Bishop Conaty, 1913. From Press Reference Library, Notables of the Southwest, Los Angeles, 1913, p. 149. A description of the Brownson Boyle Heights compound was published in the May 17, 1913 issue of Southwest Contractor and Manufacturer (see below) but a search of subsequent issues revealed no further mention of the project being issued a building permit or notice of completion. Francis Barry Byrne, 807 Trust & Savings Bldg., is preparing plans for a group of three social settlement buildings to be erected on Pleasant Ave., near Brooklyn Ave., for the Brownson House Association. The main building will be 1-story with high basement and will contain a chapel, an auditorium seating about 300, club rooms, bowling alley and shower baths. Dimensions 35x150 ft. There will be a 2-story residence for settlement workers containing twelve rooms and bathroom; dimensions 38x60 ft. The priest's residence will be 1-story and will contain six rooms and bath. The building will be frame construction with exterior plastered on metal lath, shingle roofs, pine trim, hardwood and pine ﬂoors, furnace heat in each building, automatic water heaters, electric wiring. Contractors to bid on work selected." (Southwest Contractor and Manufacturer, May 17, 1913, p. 14). W. H. Workman House, 357 S. Boyle Ave., Boyle Heights. Photo from Calisphere. The president of Brownson House at the time was Mary Julia Workman who organized numerous fund-raisers on the grounds of the Workman House, a few blocks south of the proposed Brownson House compound (see above). She seemingly did not raise enough to finance the construction as I have been unable to find any evidence that the compound was ever built. (For example, "MAY-DAY FETE IS JOYOUS AFFAIR. : THRONGS VISIT, AFFAIR AT THE WORKMAN HOME; Festival Nets Neat Sum Toward Paying for New Buildings of Brownson House Settlement--Picturesque Costumes and Decorations Lend Color to Affair," LAT, May 25, 1913, p. IV-12). Coincidentally, the publication of Byrne's Brownson compound renderings was right around the time his former employer Frank Lloyd Wright was in town visiting John and Lloyd, reconnecting with Irving Gill and meeting Harrison Albright. Byrne would likely have proudly shown his former employer his Prairie-Style handiwork as it was quite a substantial commission indeed. 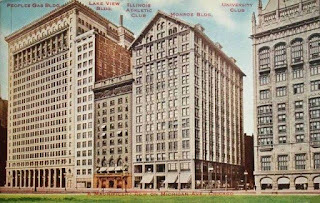 After consulting with and then ignoring his former employer Wright's advice, in February 1914 Byrne returned to Chicago to take over his former Oak Park Studio colleague and employer Walter Burley Griffin's practice. 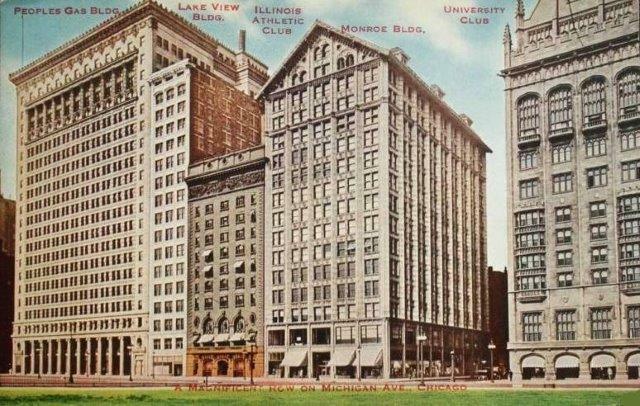 Griffin and wife Marion Mahony Griffin, another fellow former FLW apprentice, had moved into 1600 Monroe Building (see above) from their Steinway Hall location shortly after its completion in 1912. The couple moved to Melbourne, Australia to oversee their competition-winning design for the new federal capital in Canberra and invited Byrne to partner and oversee the Chicago practice.